I publish any graph with a great deal of trepidation; there are caveats and collection methodology and a lot of footnotes which go into serious data analysis which seem to always get lost in a single graph presented without context. But the context is often vital to avoid misinterpretation. Patch 5.2 is coming soon, and I’ve returned to the data collection I started while writing The Decline and Fall of Warlocks in Cataclysm to see how things look for Warlocks. One important thing I learned last year was that most Warcraft population sites are focused on current, not historical, data. This requires ‘snapshotting’ data at critical points to allow for trend analysis. This is the third snapshot I’ve taken so far. Furthermore, each site has quirks and variations which make it impossible to reconcile them exactly. We can use them to talk about general trends – as long as we do so skeptically. Instead of continuing to update the file used in Decline and Fall, I’ve created a new spreadsheet for this discussion. You can follow along in the Google Doc if you like. I’m calling this snapshot the 5.2 patch data even though we’re not officially in 5.2 yet. There won’t be any massive shifts in population in the next week or three. I’ve assembled the data from 5 time periods in a summary format to see very general trends with class movement in Mists of Pandaria, with Wrath (patch 3.3.5) and Cataclysm (4.3.3) data thrown in for comparison. This has some advantages for general population trending but is also problematic in other ways, which I’ll discuss later. 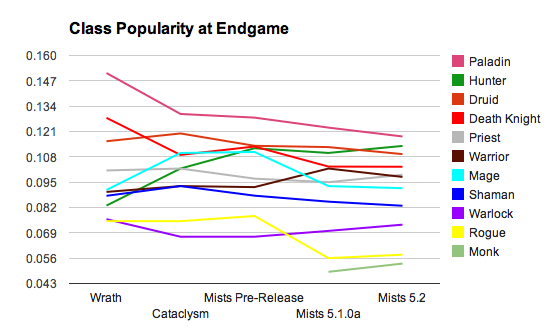 This chart, and the accompanying graph at the top of this post, are the relative population component of endgame characters for a given time period. 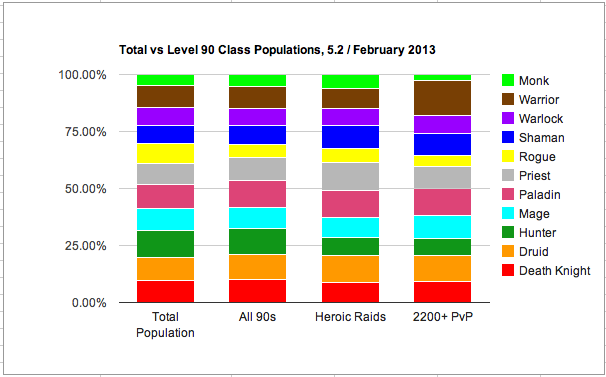 This means that the first 3 columns represent level 85s, while the last two are level 90 characters only. When I first made this type of chart last year it compared apples to apples – namely, end of expansion population figures. Players had had time to level alts and have multiple toons at endgame, so the data represented mains and alts alike. The Mists snapshots are critically different in that they are at the beginning and middle of an expansion, when leveling time is limited and content is fresh and demanding. Understanding this difference in data type is critical to avoid making hasty judgements based on these numbers. There’s a pretty big disconnect between the first two and last two columns because of this end-of-expac effect. Wrath and Cataclysm numbers are end of expansion numbers and represent mains and alts alike. Mists Pre-release represents level 85 characters before Monks or Pandaren were introduced, in patch 5.0.4. This is the final snapshot of Cataclysm, and could be considered roughly equivalent to the previous two. 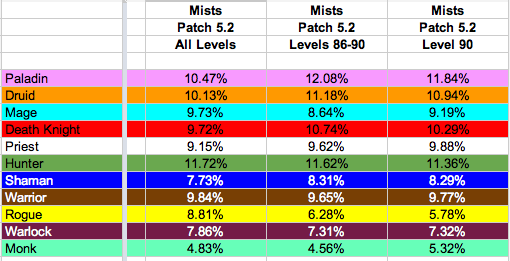 Mists Patch 5.1.0a gives us our first level 90 data. This specific data isn’t 85-90 data – it’s level 90 data. This snapshot shows us who leveled to 90 during the first few weeks, and is probably the best data point we’ll have for divining which classes players considered to be their mains, even if they switch later on. Mists Patch 5.2 is another level 90 data point, this time with additional alts and slower levelers joining the endgame. Having 3-5 level 90 characters is not uncommon in this snapshot, so now we’re seeing who else people play. There’s an additional complication in that Monks were introduced between 5.0.4 and 5.1.0a, shifting the average popularity from 10% to 9.091%. This ~1% drop can be adjusted for with indexing popularity values, but it’s not really worth it at this stage in the expansion. It’s not worth it for two reasons: because the 5.1.0a figures represent the actual popularity of main choices, so indexing isn’t appropriate yet, and because the effort to level a Monk to 90 is still substantially higher than leveling any other class from 85 to 90. Over time this will even out (and even skew towards the Monk class as their leveling bonuses come into play), but for now the imbalance should stand. Warlocks got a little more popular. Warriors got a lot more popular. Mages and Rogues were common alts at the end of Cataclysm, but not mains, or they main switched. Paladins seem to be mains but not first-tier alts, as evidenced by the relative slide in standings since 5.1. Druids (and possibly Warriors) seem to have the same issue. Hunters, Warlocks, and Monks seem to be gaining popularity as alts heading into 5.2. The drop in Rogue popularity seems to be that we’re seeing the core of the class emerge – the die hard Rogue mains who will stick with it no matter what. The Legendary daggers offered to Rogues at the end of Cataclysm artificially inflated their numbers, but we could see other players level those Rogues to 90 by the end of the expac. I feel comfortable saying this because the 85 and lower data doesn’t show a drop at all. The above data is from realmpop. I like realmpop a lot because it allows me to go through and drill down into the data, so that if I wanted to find out how many female goblin death knights are still stuck in the starter zone I could do it. The drawback is that the results are graphical and split by region, so I have to manually copy the values and add up populations between the US and EU. The sample size is large enough that I feel comfortable using relative values like popularity, but I wouldn’t want to use them for absolute values like server population. If you unhide the columns on the second tab of the spreadsheet you can see the raw data from each snapshot. The reason I think Rogues aren’t in any new state of crisis is because of the data above. When you look at the class across all levels, they’re pretty solid (and don’t show any decline.) But as soon as you get past level 85, the numbers fall off precipitously. People haven’t wanted to level them – yet. Perhaps they leveled one so their guild could get the legendary daggers in Dragon Soul. Perhaps they saw how they were performing in PvP and switched (more on that later.) But they’re there – just not at the endgame. There’s a different set of problems there, of course. Why is there this drop off? Why do people not want to level Rogues to 90 but do want to level Paladins or Shamans or Warriors instead? There are problems here, but they’re not as simple as the problems affecting Warlocks in Cata. I’ll leave that up to the Rogue bloggers to discuss, but I expect Blade Flurry has something to do with it. My own Rogue has been stuck at level 67 forever. One of the other data sites I’ve come to rely upon has been World of Wargraphs; like realmpop, it pulls data directly from Blizzard’s API (not through in-game addons, like Warcraft Realms), but it presents the data in very different and interesting ways. The PvE/PvP breakdowns, in particular, are very helpful in determining what specs are over- or under-represented in high end play. Guardian Druids are not present in the data as a separate spec. Arms Warriors are an amazing 11.4% of all 2200+ characters surveyed. I think we found our missing Rogues. There are some specs which are struggling in both environments. Unholy DKs, Demonology Warlocks, Holy Priests, Marksmanship Hunters, even Fire Mages could use a look. Hunters, in general, seem to be having problems at endgame. It could be a number of reasons – perhaps it’s that they’re easy to get to 90, but hard to master in raids and PvP alike. Perhaps they’re too complicated to play well at 90. Or perhaps it’s that they are favored alts for dailies? I honestly don’t know. A few specs are doing well in both environments. Holy Paladins, Shadow Priests. Really, the biggest story from this data is how overwhelmingly popular Warriors have become for ranked level 90 PvP, and how scarce Rogues have become in that same activity. I think these trends are absolutely related. Overall, the changes to the Warlock class in Mists seem to have had a positive effect on relative popularity. Players are rolling Warlocks and leveling them to endgame. This is a massive improvement! Affliction and Destruction are reasonably represented in PvE and PvP. Demonology seems to be less common in high level play, but one of the current Arena world champions won playing Demo, so I don’t know what to really say to that yet. Perhaps it’s just that it’s really tricky to master? Don’t know. Patch 5.2 presents something we haven’t seen in a while – Warlock-only quests. There’s a lot of interest around the green fire quests which will no doubt prompt people to try leveling one to 90 to give them a try. This kind of attention can be good if the class fundamentals are sound, which I think they are again. But it’s going to skew numbers in the future. We need to collectively remember that when looking at the class later on. 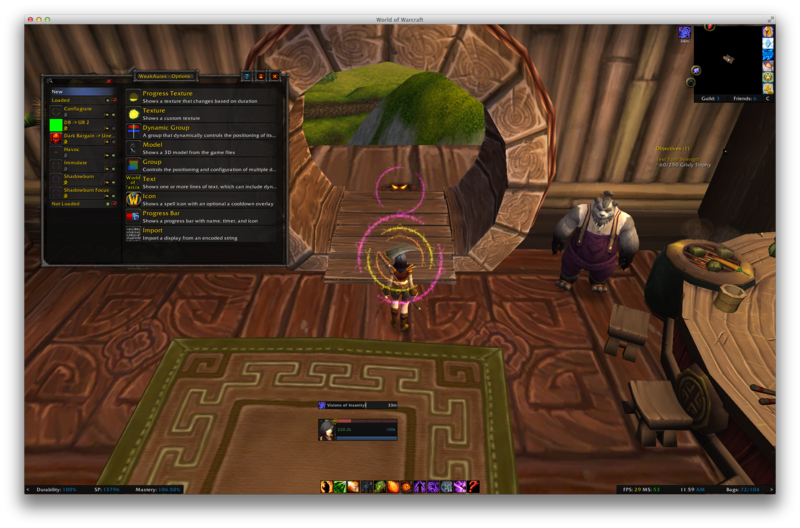 Feb 2013 UI with Weak Aura Configuration – click to embiggen! Possibly the biggest change I made when warlocks were revamped in Mists of Pandaria was to throw out my keybinds. That one decision to jettison what I knew about the class and start over allowed me to dramatically change my UI, because it had been built up to support a very specific keybind structure. It allowed me to move away from the Cast Keyboard / Move Mouse style I’d gotten trained into (I now use a more traditional ESDF layout with the Naga) and simplify things considerably. It also made me look at what the default UI could and couldn’t do, and that in turn led me to try out Weak Auras, a really powerful addon and the replacement for Power Auras. Auras are already part of the default UI – different classes will have event procs display as a graphic that shows up on the screen to let the player know that an ability is usable, or the mana cost is free, or some benefit is available. Weak Auras allows you to customize auras beyond the default. It’s a little tricky to set up at first, but if you take your time and are clear about your requirements then it’s no harder than Need to Know. My own setup is relatively simple in concept – use a series of spinning concentric circles to alert me to certain powerful spells becoming available. I didn’t want to track every buff or action, but I did want to give myself some kind of visual prompt to take immediate action. Shadowburn, for instance, is an extremely powerful execute spell that Destro locks should use whenever it’s available, which is when the target is below 20% health and you have a Burning Ember to spend. The problem with the default UI is that the button doesn’t light up when you can cast it (unlike Execute or other similar spells) – it just becomes quietly castable. Adding an Aura to let me know that it’s up allows me to cast it more often. The big circles in my UI shot above are for my target, while the smaller ones above my character’s head are for my focus target. They circle around. The big purple circles are Shadowburn. I wanted something really big and visible since effectively using Shadowburn in PvP allows you to get your opponents down much much faster. Most people don’t get up from a Shadowburn. Moving in, the yellow circle is Conflagrate. In PvE you might cast Conflag on CD, but I do like to save it for the snare effect in PvP. I found that I wouldn’t always look and see if Conflag was up before trying to cast it (instead of Fel Flame), so this aura provides a reliable way for me to know which instant to spam. The inner orange circle is Immolate. This aura just tells me if Immolate is on the target or not. Immolate is not a must-have DoT anymore, but this is a convenient way for me to know if I am applying pressure at a moment’s glance or not. If I were to trim anything, it would be this one. The upper purple circle is Shadowburn again, but on my focus. Visual consistency is important, but so is knowing if my focus target is able to be shadowburned or not. The evil looking eyes are letting me know that Havoc is available to cast on my focus. I use a simple macro which sends Havoc to my focus if one is selected, or to my target if I have no focus. This aura helps me know that I’m all set and ready to wreak havoc. This provides a relatively simple alerting system for Destruction Warlocks that covers my bases. If I were playing more PvE, I might add in a Backdraft Proc tracker to let me know that I should cast Incinerate instead of Chaos Bolt. I’m also experimenting with a Dark Bargain/Unending Resolve series of auras to let me know to when DB is about to fall off so I can cast Unending Resolve to lessen incoming damage, but I’m not sure that I really want that one right now. There are also some buff reminders I should put up (make sure Dark Intent is on, remind when pet is dead and no corresponding buff available, etc.) but that’s a project for another day. One of the nice elements of Weak Auras is that it allows you to export settings to share with others, which I’ve done below. These strings – and they’re messy and long – can be copy and pasted into Weak Auras so you can get the exact aura someone uses, either to use out of the box or customize to your desired effect. I’ve included these strings below.